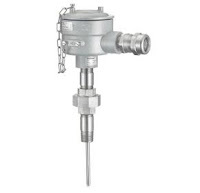 Proper temperature sensor selection is key to getting useful and accurate data for maintaining control of a process. 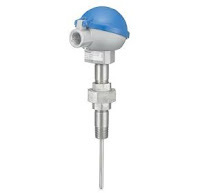 There are two main types of temperature sensors employed for industrial applications, thermocouple and resistance temperature detector (RTD). Each has its own set of features that might make it an advantageous choice for a particular application. Thermocouples consist of a junction formed with dissimilar metal conductors. The contact point of the conductors generates a small voltage that is related to the temperature of the junction. There are a number of metals used for the conductors, with different combinations used to produce an array of temperature ranges and accuracy. A defining characteristic of thermocouples is the need to use extension wire of the same type as the junction wires, in order to assure proper function and accuracy. Here are some generalized thermocouple characteristics. Various conductor combinations can provide a wide range of operable temperatures (-200°C to +2300°C). Sensor accuracy can deteriorate over time. Sensors are comparatively less expensive than RTD. Stability of sensor output is not as good as RTD. Sensor response is fast due to low mass. Assemblies are generally rugged and not prone to damage from vibration and moderate mechanical shock. Sensor tip is the measuring point. Reference junction is required for correct measurement. No external power is required. Matching extension wire is needed. Sensor design allows for small diameter assemblies. RTD sensors are comprised of very fine wire from a range of specialty types, coiled within a protective probe. Temperature measurement is accomplished by measuring the resistance in the coil. The resistance will correspond to a known temperature. Sensor provides good measurement accuracy, superior to thermocouple. Operating temperature range (-200° to +850°C) is less than that of thermocouple. Sensor exhibits long term stability. Response to process change can be slow. Excitation current source is required for operation. Copper extension wire can be used to connect sensor to instruments. Sensors can exhibit a degree of self-heating error. Resistance coil makes assemblies less rugged than thermocouples. Each industrial process control application will present its own set of challenges regarding vibration, temperature range, required response time, accuracy, and more. Share your process temperature measurement requirements and challenges with a process control instrumentation specialist, combining your process knowledge with their product application expertise to develop the most effective solution.